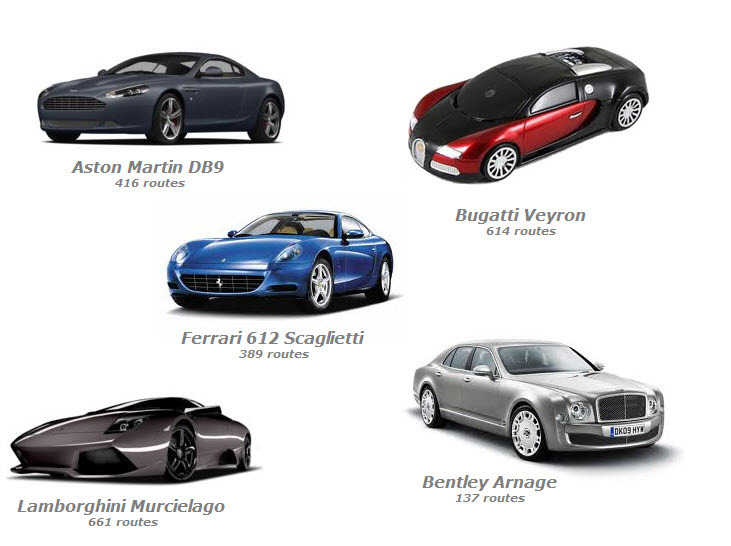 The World’s Most Expensive Cars Among the Million Vehicles Entered on Cost2Drive.com. 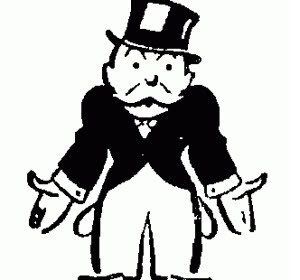 Its getting so bad even the rich are feeling the pinch of high gas prices. On the eve of the North American International Auto Show (also known as the Detroit Auto Show) we thought it timely to release some data in the coming week regarding the types of vehicles users are entering on Cost2Drive.com, especially since gas prices are at historic highs for this time of year and we just surpassed one million vehicles that have been entered in our popular fuel calculator app. As soon as we started digging through the data we noticed some startling results. Among the tens-of-thousands of Toyota Camrys, Honda Civics and Ford Explorers that we expected to see were thousands of luxury vehicles, some even in the super-luxury category. Now, I won’t speculate on whether any of the 614 users that entered the Bugatti Veyron as their vehicle were real owners of this exotic sports car given the $1.8 million price tag, but the sheer volume of routes entered with luxury vehicles means its likely that real owners are using the site to help budget for car trips. Moving down a tier from the super-expensive to just the expensive finds an increasing volume of routes entered with the more familiar luxury car names like Buick, BMW and Acura. In fact nearly 10%of all the vehicles selected on Cost2Drive fell into the luxury or super-luxury category. 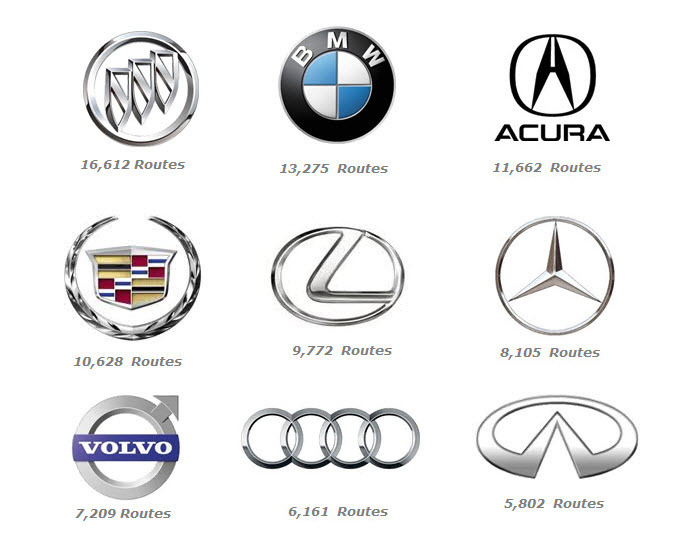 Buick led all manufacturers in the luxury segment with over 16,000 routes entered on Cost2Drive by Buick owners. The top vehicle type was from owners of the BMW 3-series who entered nearly 7,000 routes. 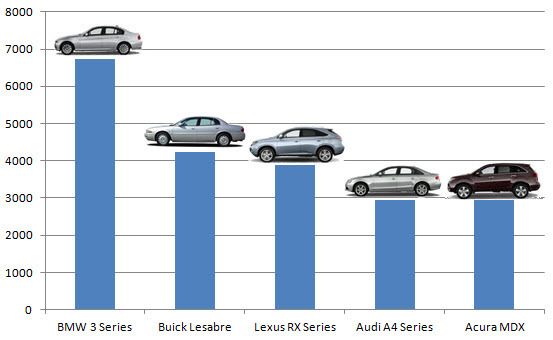 Here are the top 5 luxury vehicles that were entered on Cost2Drive. The average age of all luxury vehicles entered on Cost2Drive was 8.4 years. 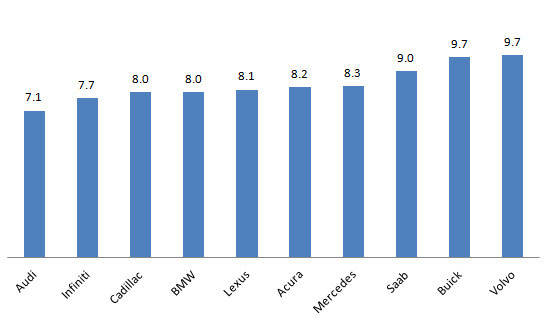 Below is the age breakdown from the top ten luxury vehicle manufacturers based on the volume of routes entered on Cost2Drive.com. So what about the other 900,000 vehicles that have been entered on Cost2Drive? We’ll be revealing additional interesting data on these cars and light trucks later this week. Part 1 of a 3 Part Series: This is the first installment of 3 posts we’ll be publishing to coincide with the North American International Auto Show (NAIAS) where we’ll reveal data on over 1 million vehicles that have been entered on Cost2Drive.com. This entry was posted in Autos, gas prices, Uncategorized and tagged Acura, automotive, BMW, bugatti, Buick, car, detroit auto show, exotic sports car, Ferrari, Lamborghini, Lexus, luxury car, Mercedes, NAIAS. Bookmark the permalink. I’ll stop there as I’m only partially through the list, but its only 2 weeks of data and growing rapidly. Also, keep in mind that people drive fuel efficient cars for reasons other than thrift, which is why BMW and Bentley and other luxury makers are introducing their own electric and hybrid vehicles.